CarrieAnn Therese has had a love affair with glass for as long as she can remember. She has always had an overabundance of creative energy, working in various mediums as well as music her whole life, but always knew glass was the medium she wanted to focus on. CarrieAnn loves the dance of colour and light in glass, saying it’s like “playing with rainbows”…how can a person not love that? Though certainly, some of her work is functional; it is primarily sculptural and distinctly Contemporary.CarrieAnn loves to “bust things up” and experiment with textures, giving a very “organic” quality to her pieces. It’s not just how the glass looks but also how it feels. In addition to maximising it’s textural qualities, working in abstracts, she works with the light, and the ongoing dance between light and glass that creates magnificent “shadow-plays” of colour, shape and design in a space. She also enjoys poking around hardware stores and salvage yards looking for interesting shapes that can be repurposed and combine into sculptural pieces with the fused glass. Nothing she does is about production. It is ALL about heart, soul and inspiration; which is how SOUL FUSION ARTS got its name. Everything around her, be it natural, industrial or entirely spiritual; she sees as a creation in glass. An emotion can evoke an entire concept for a piece. Glass is like a living organism andCarrieAnn finds that very exciting. Every type of glass has a personality all its own, and sometimes “it decides” what it wants to be. You have to respect the glass and all its characteristics, in order to coax it into something new and unusual. CarrieAnn Therese work is greatly influenced by the natural landscapes of the Sonoran Desert. Arizona has such amazing textures and colours in the mountains and rock formations, the rich minerals, the canyons…CarrieAnn believes art touches each of us in ways we don’t even realise. There is such intense beauty in everything around us and too often, people take that for granted. They become accustomed to seeing it every day. It is constantly changing with the light throughout the day, throughout the year….andCarrieAnn is in constant awe. CarrieAnn Therese believes art in all its forms has a great capacity to heal; not just individuals but the brokenness of our world. CarrieAnn was always very involved in social justice and environmental activism work as well as foster parenting teens and rescue animals (all of which she adopted!) The intersection of art meeting with the mind+spirit+body connection is extremely powerful. 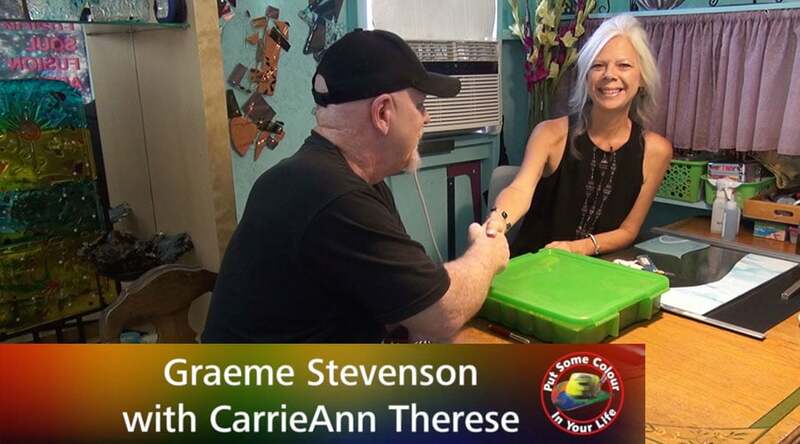 CarrieAnn Therese is currently writing a book using her art as a metaphor for her journey through life. ~ ​I don’t “make art”. I create pieces that create something in me. It feeds my soul. For me, being in the process that connects to a special, almost sacred space deep within that allows me to create; brings me into a deeper connection with the Divine. Art is a very necessary, spiritual and meditative process for me. We all need to find our inner voice. Why is this content restricted?